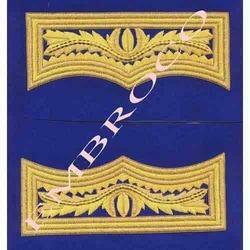 Pioneers in the industry, we offer Embroidery Cuffs & Coat Badges from India. These are highly appreciated by our valuable clients. These products are available in market at economical rates. 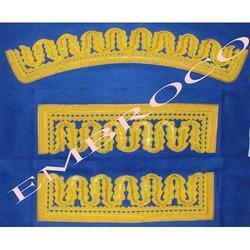 Embroidered Cuff is the lower edge of the sleeve of a garment covering the arms. Cuffs may be turned back, or a separate band of material may be sewn on or worn separately. The cuff may show an ornamental border, or have an addition of lace or other trimming. The functional purpose of turned cuffs is to protect the material from fraying and, when frayed, to allow the cuffs to be repaired or replaced without major changes to the garment. We are reputed manufacturer, exporter and supplier Hand made bullion Embroidery Coat Badges. The embroidered coat badges are appreciated by large number of clients. Made of the finest fabrics, these embroidered badges are provided in wide options of colors, size and shape to choose from. These products are available in market at economical rates. Looking for Embroidery Cuffs & Coat Badges ?